Traditional mold remediation contractors treated mold the same way as one would treat asbestos removal, by taking the “infected” construction materials out of the home. The policy was essentially, “when in doubt, rip it out”. It's Expensive: Perfectly good building materials are removed, wasting materials and money. It's Ineffective: Remediation can spread spores. There is always the risk that mold spores will reattach and mold growth will return, especially if the underlying moisture issues are not solved. Organic, living mold is NOT the same as inorganic asbestos. It makes no sense to treat it the same way! Two applications: an EPA-approved quaternary amine-based fungicide and a unique, patented SMART polymer with time-released antimicrobial ingredients. Long-term moisture control with dehumidifier installation. Traditional mold remediation contractors focus on the removal of moldy materials and not on the moisture issues that caused the mold problem. Conduct a Water Intrusion Inspection to find mold and locate moisture and water sources to resolve the problem. 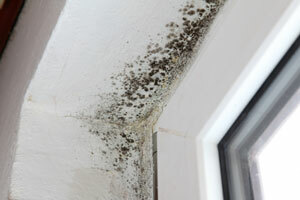 Apply an EPA-registered, multi-purpose fungicide to kill the mold. Apply the unique, proprietary, non-toxic SMART polymer to destroy mold at the cellular level. This polymer stops any new mold growth in its tracks. Install a commercial-grade dehumidifier to keep indoor humidity down to the recommended level. With a purchase of our commercial-grade dehumidifier, homeowners are eligible to renew our Mold Treatment one-year guarantee for up to 5 years with an annual dehumidifier service contract. Less invasive or disruptive to occupants/employees: Typically back in your home/business within the same day. 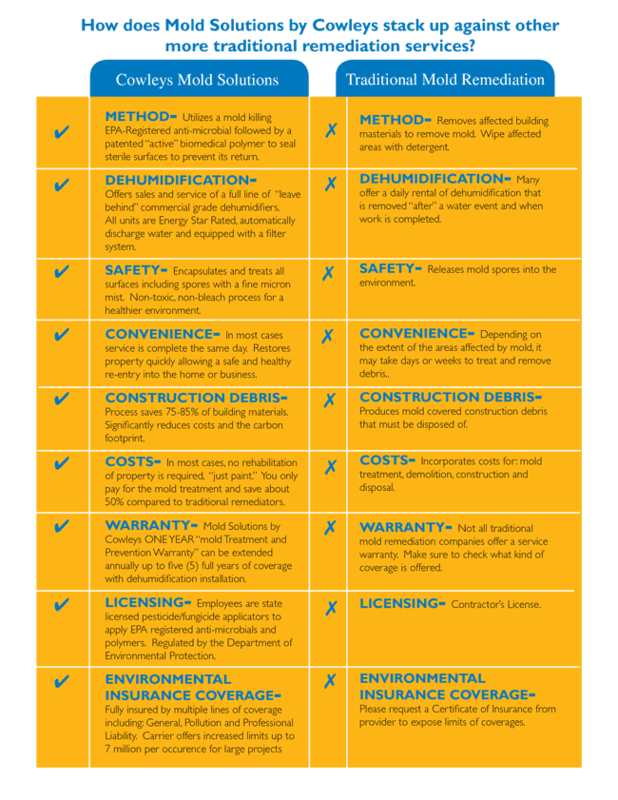 Less costly: Building materials are usually saved and unnecessary major construction typically avoided. One-year warranty, extendable up to five (5) years (with purchase of dehumidifier and yearly renewable service contract). Customer owns a commercial-grade dehumidifier, a valuable long-term home investment. Call Mold Solutions by Cowleys to learn more about the benefits of the MAPS system versus traditional mold remediation techniques. We offer free estimates on all our work in Cherry Hill, Woodbridge, Toms River, Bridgewater, Princeton Junction, Middletown, Old Bridge, Piscataway, New Brunswick, Lakewood, and the surrounding areas.